New, clean, spacious, high quality, great staff, good breakfast, lots of parking, convenient location. Couldn’t have been better. And the price was excellent. Where to find Bonnyville hotels near an airport? Where can I find hotels in Bonnyville that are near tourist attractions? Heading to Central Alberta and planning to book a hotel in Bonnyville? Around 11 hotels can be found within a 0.1-kilometre (0.06-mile) radius of Bonnyville's town center. 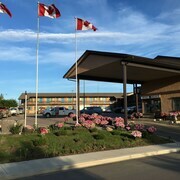 Within 1 kilometre (0.6 miles) of Bonnyville's center, you can stay at a selection of Expedia-listed hotels, such as the Bethel-Aspen Inn and Centre Suites Inns Motel. 2 kilometres (1 mile) away from the heart of Bonnyville is the The Neighbourhood Inn. This is an excellent option for visitors seeking cheaper lodgings. An alternative no-frills place to stay in this region is the Days Inn Bonnyville. 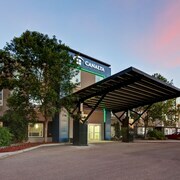 The Holiday Inn Express Hotel & Suites Bonnyville is positioned 1 kilometre (1 mile) away from the main part of Bonnyville. 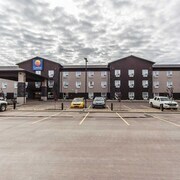 Another accommodation option is the Best Western Bonnyville Inn & Suites, which is positioned 2 kilometres (1 mile) away. 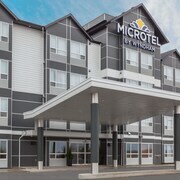 The Bonnyville Hotel and also the Microtel Inn & Suites By Wyndham Bonnyville are two more Expedia-listed Expedia-listed accommodations around Bonnyville. If time permits, you could explore the other scenic and cultural delights of the Central Alberta region. Spend time at Central Alberta's old towns and archeological sites or admire the region's forests, rivers and streams. Fun-loving visitors might also try their hand at snowboarding and skiing in this part of Canada. St. Paul is found 35 kilometres (22 miles) to the east of Bonnyville. Here, you can discover the Grand Centre Golf and Country Club. Cold Lake features some nice places to spend the night. While exploring the Central Alberta region, why not visit St. Paul, where you'll find the St. Paul Golf Club. St. Paul can be found 45 kilometres (29 miles) to the southwest of Bonnyville. Expedia-listed accommodations in St. Paul include the Canalta St Paul and Galaxy Motel. Before you head home from Central Alberta, make sure you catch some local sport. Visit Centennial Centre to the east of Bonnyville. For tourists who are interested in staying close by, make a reservation in the Bonnyville Manor - Centre Suite Inns or Comfort Inn & Suites. 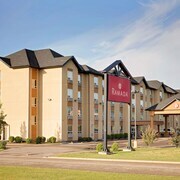 For travelers arriving or departing via Edmonton International Airport, you may choose to book accommodation at Best Western Plus Denham Inn & Suites, or Ramada Edmonton International Airport, both of which are conveniently close. What are the most popular Bonnyville hotels? 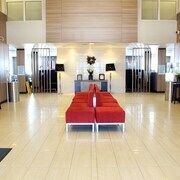 Are there hotels in other cities near Bonnyville? What other types of accommodations are available in Bonnyville? Explore Bonnyville with Expedia.ca’s Travel Guides to find the best flights, cars, holiday packages and more!